Classic and unmistakable, you will turn heads This Halloween when you walk in wearing this Rhinestone R2D2 Tank Dress for Adults! 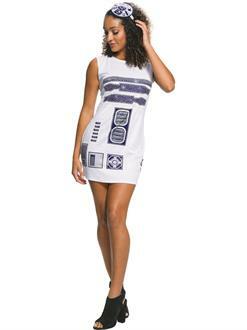 Adorable and fun, this party dress comes bedazzled in the unmistakable design of everyone's favorite Droid and is a great way to show off your Star Wars fandom! Made of high-quality and durable materials for a comfortable dress you will love to wear for Halloween, and any other costumed occasion year round! Don't wait until the week before! Have it when you need it when you order yours online today!